Simon Rattle is one of a number of celebrity musicians who have spoken out against Brexit because of their concern over the resulting potential restrictions on freedom of movement. For his farewell Asian tour with the Berlin Philharmonic and soloist Lang Lang, Rattle takes the orchestra in November to Chinese cities including Guangzhou, Wuhan and Hong Kong. Human Rights Watch reports that: "On January 29, 2016, the Guangzhou Intermediate People’s Court’s sentenced Tang Jingling, Yuan Xinting, and Wang Qingying to five, three-and-a-half, and two-and-a-half years respectively for “inciting subversion of state power.” The three men were convicted for promoting the ideas of “non-violent civil disobedience” and of promoting peaceful transformation to democratic rule in gatherings of activists. The guilty verdicts and prison terms reflect the Chinese government’s politicized manipulation of the courts and its increasing hostility toward peaceful dissent". There is more on the persecution of Guangzhou activists in a New York Times story from which the photo* of protesters in the city is taken. Next stop on Simon Rattle's itinerary is Wuhan. Another human rights monitoring organisation Front Line Defenders reports that: "On 11 April 2016, Mr Liu Xinglian was released from custody in Wuhan No.2 Detention Centre due to ill-health. He had been arrested on 19 June 2015 on charges of 'inciting subversion of state power' by police in Wuhan city, Hubei province. Liu Xinglian is a human rights defender and secretary of the domestic organisations China Human Rights Watch and the Rose Group. Both are domestic organisations which pursue equal rights for all, highlight cases of human rights abuses and assist those who have had their rights violated. Liu Xinglian is also President of the Haikou City Muslim Association and he works with marginalised groups in the Muslim community in Hainan province". Hong Kong hosts two concerts on the Berlin Philharmonic tour and earlier this year Human Rights Watch reported that: "The Hong Kong authorities’ arrest of 11 pro-democracy advocates over two days raises grave concerns of a politically motivated crackdown. While all have been released on bail, they face prosecution and possible prison sentences. Hong Kong authorities have prosecuted at least 18 pro-democracy political leaders in the territory since the end of the massive Umbrella Movement in December 2014. 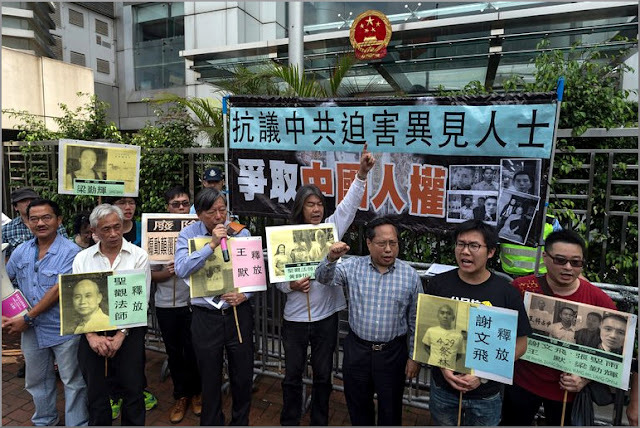 "Prosecution as persecution seems to be the new norm for the treatment of Hong Kong’s pro-democracy activists,” said Sophie Richardson, China director at Human Rights Watch. “Hong Kong authorities’ abuse of the law to intimidate dissent increasingly resembles tactics employed just across the border.”"
Despite recent widespread approval of political interventions, Simon Rattle and his peers have remained notably silent about human rights abuses by the Chinese regime. The value of the music market in China is forecast to reach $1.05 billion by 2019. So protests about human rights in China are out of the question because classical music's celebrities and their management want a slice of that very tasty cake. This is the world we live in, and please do not let us pretend otherwise. * Photo credit is Jerome Favre/European Pressphoto Agency. Any copyrighted material is included as "fair use" for critical analysis only, and will be removed at the request of copyright owner(s). Also on Facebook and Twitter. "The value of the music market in China is forecast to reach $1.05 billion by 2019. So protests about human rights in China are out of the question because classical music's celebrities and their management want a slice of that very tasty cake. This is the world we live in, and please do not let us pretend otherwise." Kudos once again to Bob Shingleton for casting light on those corners conveniently situated in the shadows. Many uncomfortable topics here, but sadly, none are surprising. Rattle's words make little sense even if you take them at face value. How does he explain how the LSO kept up its relentless schedule of foreign tours in the 1960s and 70s in a world where there was no Schengen agreement, over half of Europe was behind an unrusted Iron Curtain and where passport and visa requirements for most countries were much more stringent than they are today?